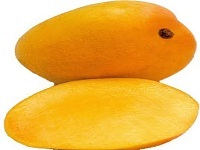 A fully ripe mango can be stored in the refrigerator for up to five days before using. If the mango is too firm, place it in a plastic bag along with one or two ripe bananas so the mango will finish ripening and become soft. · Keep unripe mangos at room temperature. Mangos shouldn’t be refrigerated before they are ripe. · Mangos will continue to ripen at room temperature, becoming sweeter and softer over several days. · To speed up ripening, place mangos in a paper bag at room temperature. · Once ripe, mangos should be moved to the refrigerator, which will slow down the ripening process. Whole, ripe mangos may be stored for up to five days in the refrigerator. · Mangos may be peeled, cubed and placed in an airtight container in the refrigerator for several days or in the freezer for up to six months. · Always use a clean knife and cutting board to cut a mango. · There are specially designed mango peelers that will give a certain degree of success when peeling the juicy fruit, but if you want to peel it old-school style with a knife, try this: Place mango on a solid surface, stem side up. Place knife near the center of the fruit and cut from top to bottom, keeping knife close as possible to the pit. Then slice along the other side of the pit. Once the slices have been removed from the pit, lay slices peel side down, score fruit flesh and slice off peel. A flexible fillet knife work well for this peeling task. · Mix mango cubes into your favorite fruit salad (mangoes and coconut make perfect flavor combinations) or add diced mangoes to your favorite salsa or chutney recipe. Puree mangoes and use in marinades or as a natural meat tenderizer. Toss mangoes in theblender along with other fruit favorites to add a sweet-tart depth of flavor to healthy fruit smoothie, or try my personal favorite - peel and eat a mango as-is.